As you progress in judo you will want to test your skills against the abilities of others of your own age, weight, and skill level. A judo tournament is the place to do this. Tournaments are hosted and organized by local clubs and national organizations. A typical tournament day begins with registration and weigh-ins. Registrations are often held in the morning before the tournament, usually from 8:00 am to 10:00 am. Some events require pre-registration by mail several weeks prior to the tournament. Usually there is a small fee required to enter the tournament. Make sure to bring your Judo membership card. Minors entering tournaments will require permission from a parent or legal guardian in the from of a signature on the registration form. Registration details are found on the tournament notice which is sent to clubs in advance. After all contestants have registered, the tournament officials will set up the draw to decide who fights who. Tournament draws are set up so that you will fight people of your own age, weight, and experience level. Details of the age, weight and experience divisions are found on the tournament notice. When the tournament begins, an official will announce the names of the people fighting in a division. Since there is often more than one fighting area, you will be directed to the mat area where your division will be competing. A worker at the mat area will identify the next two contestants. One will be given a blue belt (worn around the waist) and/or be asked to wear a blue judogi. Competitors bow before entering the competition area. They walk to the outside edge of the contest area (outside edge of the red mats) on their respective sides (white side/blue side) and bow again. They proceed to their lines. Then they face each other and bow together to each other. They then take one step forward and stand inside their lines with their hands at their sides and their feet apart. This shows that they are ready to begin. The referee shall announce "hajime" (begin) and the contestants will begin. Each time matte (wait) is called they return to their spots inside their lines. When the referee calls soremade (that is all), they return to their positions and await the decision. When the referee awards the match, they each step back behind their line, and bow together. They leave the competition area the same way they came, bowing again at the edge of the contest area (the outside edge of the red area). When a contestant scores ippon, the referee shall announce, "ippon, soremade". An ippon, or full point, immediately ends the match (like a pin in wrestling, or a knock-out in boxing). The contestant scoring ippon is the winner. An ippon can be scored in both tachi-waza (standing) and ne-waza (groundwork). Ippon is scored when: A contestant with control throws the other contestant largely on his back with considerable force and speed; or a contestant holds with osaekomi-waza the other contestant, who is unable to get away for 25 seconds after the announcement of osaekomi (osaekomi to be covered later); or a contestant gives up by tapping twice or more with his hand or foot or says "maitta (I give up), generally as a result of a grappling technique, shime waza (strangle) or kansetsu-waza (armlock); or the effect of a strangle technique or arm lock is apparent to the referee. Should one contestant be penalized "hansoku make" the other contestant shall be declared the winner. Should a contestant score two waza-ari's (or equivalent: waza-ari + 3 minor penalties for the opponent) he shall be declared the winner by ippon. 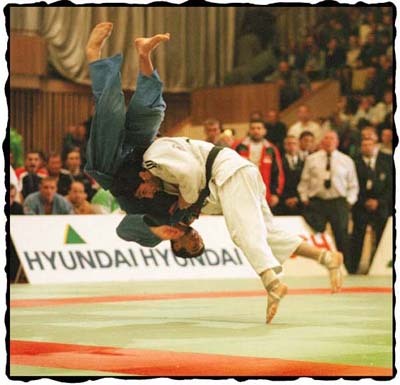 Waza-ari is scored when: A contestant throws the other contestant with control, but the technique is partially lacking one of the elements necessary for ippon, or a contestant holds with osaekomi-waza the other contestant who is unable to get away for 20 seconds or more, but less than 25 seconds. Should one contestant be penalized shido three times, the other contestant shall receive waza-ari immediately. Yuko is scored when: A contestant with control throws the other contestant, but the technique is partially lacking two of the other three elements necessary for ippon, or a contestant holds with osaekomi-waza the other contestant who is unable to get away for 15 seconds or more, but less than 20 seconds. Should one contestant be penalized shido two times, the other contestant shall immediately receive yuko. If ippon is not scored, the winner of the match shall be the contestant who has scored the most of the point which holds the highest value (for example waza-ari is higher than yuko. If one contestant has six yukos and the other contestant has one waza-ari, the contestant with the waza-ari (the larger point) will be declared the winner. If the score is even at the end of the time allowed for a match, usually there will be a Golden Score period where the timer will be reset and the first contestant to score any point wins. If there is no score at the end of the Golden Score period then the referee and judges will decide the winner. They will signal their choice for winner by raising either a blue or white flag (corresponding to the blue and white sash or gi worn by the competitors). All decisions are decided by "majority of three" (i.e. at least two of the three officials). Osaekomi – The referee shall announce osaekomi when the contestant being held is controlled by his opponent. He must have his back, both shoulders, or one shoulder in contact with the mat. Control can be made from the side, from the rear, or from the top. The contestant applying the hold must not have his leg(s) or body controlled by his opponent's legs and at least one contestant must have any part of his body touching the contest area at the announcement of osaekomi. Should any one of these criteria not be met after the announcement of osaekomi, the referee shall immediately call toketa and the hold will be considered broken. Sonomama – If at any time the referee announces "sonomama" (freeze, he will place one of his hands on each contestant as he calls sonomama) the contestants will immediate stop, and "freeze" in whatever position they are in. When he wishes the action to continue, the referee will apply pressure down with his hands on each contestant, and call yoshi (continue) as he lifts his hands from the contestants. Matte – When matte (wait) is called, the contestants shall come back to their positions in front of their lines and await the announcement of hajime (begin) to continue. In Bounds, Out of Bounds – You cannot step outside on purpose and all throws must begin in bounds. Once you start an attack you may continue outside. In katame-waza (pins) both contestants must be all the way out of bounds (i.e. no part of either contestants body touching the contest area) to be considered out of bounds. If you have any questions about tournament procedures ask your sensei or an experienced competitor. They will be glad to answer any of your questions.